Alteknacker wrote: Quoich West end? PS Loch Toll an Lochain would've been my guess too. Sorry for the delay in replying - I somehow lost sight of it. Thank-you, welcome back. By the way "Where's the picture (Scotland)? " is also waiting for your input! Clue time. It is between 2 great hills (IMHO) that I have recently visited. I'm a bit surprised that no-one has come forward with an answer. Another clue, there is a "nose" of the same name nearby. Correct! and you should recognise that the photo is from my TR for that section of the Watershed. Your turn. 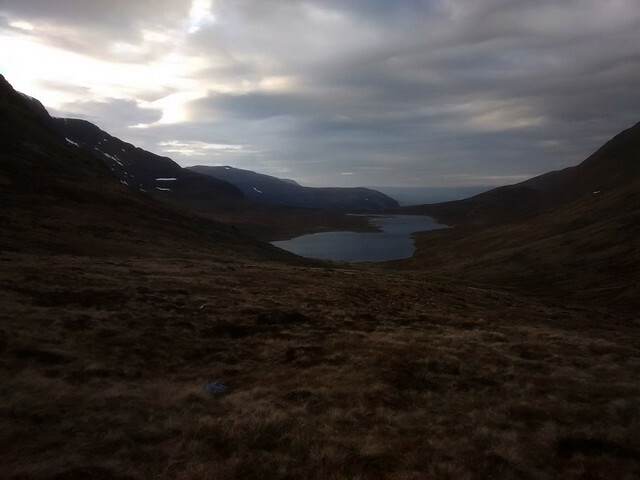 Yes, I guess I should, but I actually suddenly remembered it from my own wandering through the bealach from which the pic is taken - the pic in my WR is almost identical! It's the Lochan below Binnein Beag looking towards Binnein Mor. It's not named on my map and no idea what it's called. Sunset Tripper, you got it first time (cheating a bit, I was, since, as you say, it doesn't appear to have a name....). Cheers Alteknacker, sorry for the delay. Try this one on the bottom left.